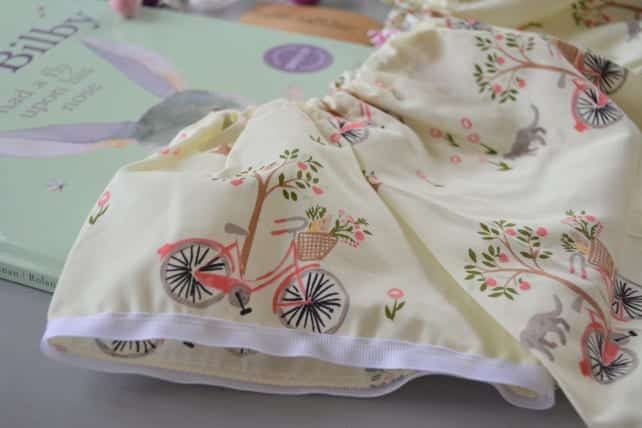 In one of those really weird online/offline worlds collide moments…I ordered a gorgeous organic cotton nightie for Pud from online company Nightie Night Lane a few years ago and noted that one of the business partners lived in Sydney and one in Brisbane. 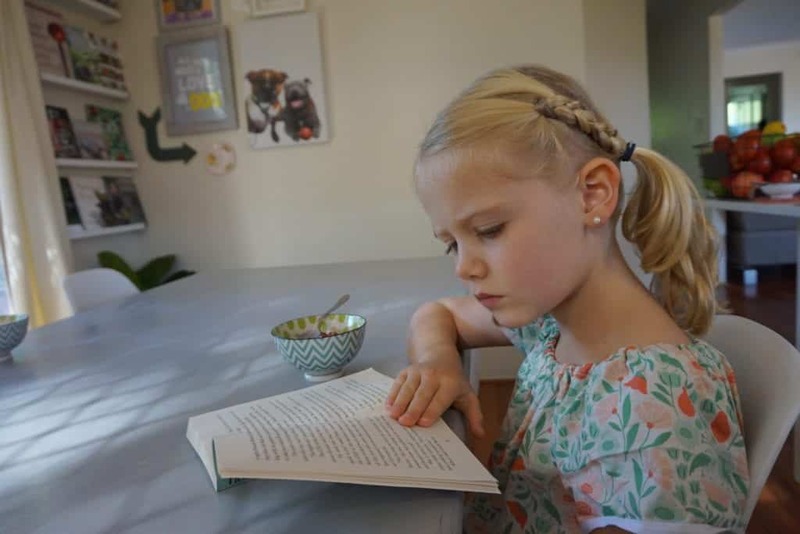 I mentioned that I was in Brisbane and as the online conversation continued, it turned out that not only did the business partner live in Brisbane, she lived near me, her kids went to the same school as mine…and her youngest daughter was one of my daughters closest friends. I mean seriously? So we scraped postage and the nightie was hand delivered to school. It was just ridiculous! 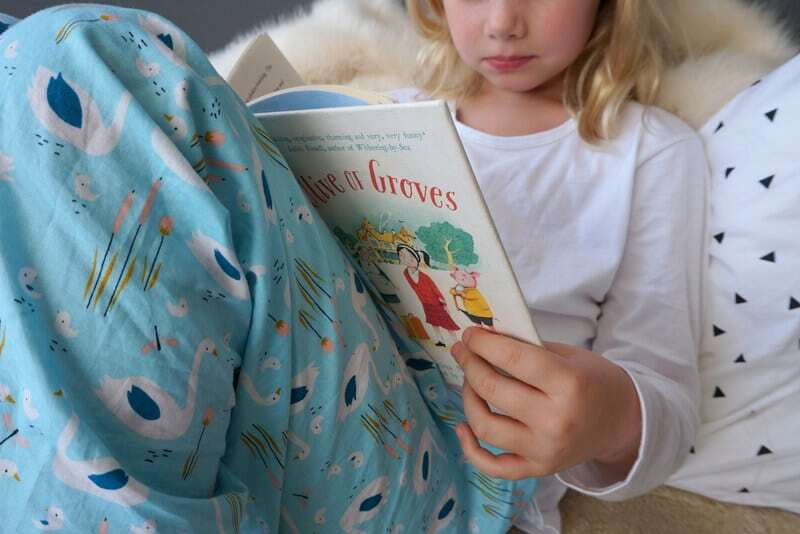 Natalie (who’ve actually not met offline yet) and Verity (who is now one of my inner circle of school mum friends) are the most delightful women and their organic cotton PJ’s are utterly gorgeous, affordable, hard wearing (ChickPea trashes clothing and has not yet managed to damage one of their nighties), so very, very beautiful to wear and are everything I ever wanted in PJs for my children. We now own quite a few nighties and sets of PJs, my most recent purchase being the very beautiful ‘Sleep Cycle’ nightie for Pud, pictured below, along with some of her others. 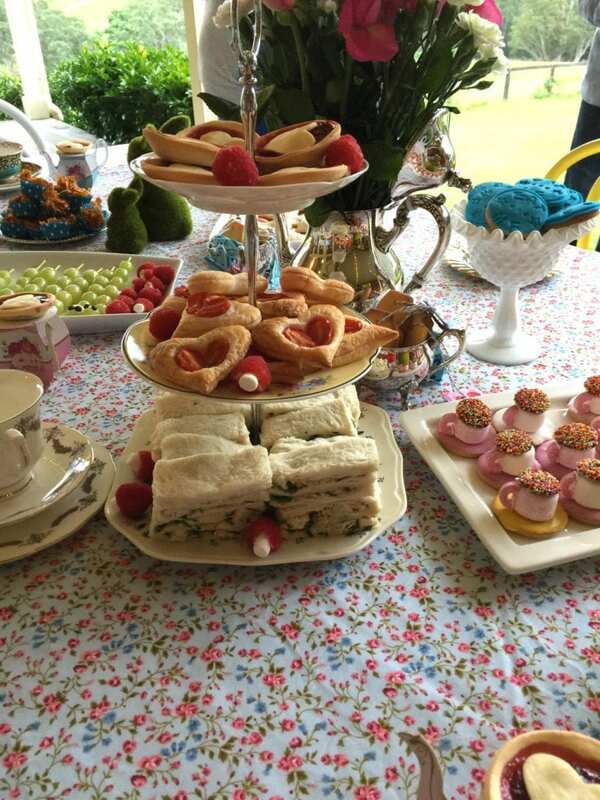 It turns out that Natalie is also rather the party planner and when I found out she’d recently hosted an Alice in Wonderland 10th birthday party, I had to know the details as it just looked so gorgeous. Thank you Natalie for sharing this with us! Isn’t it weird the way we meet people these days? Online friendships rock! 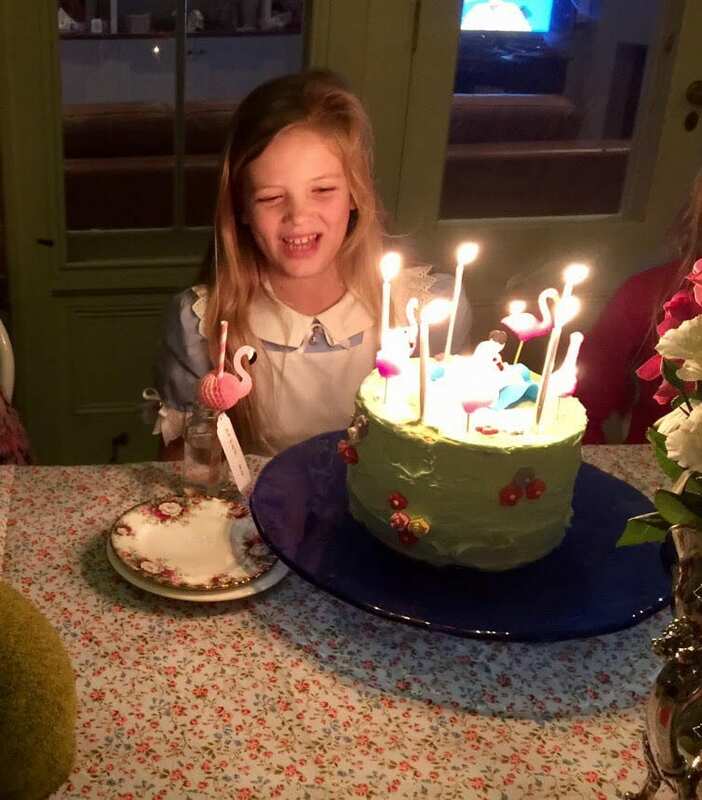 We absolutely love a kids party on Nightie Night Lane and we also really love books so when The Little Lady requested an Alice in Wonderland tea party for her 10th birthday, well, mummy got a bit excited! 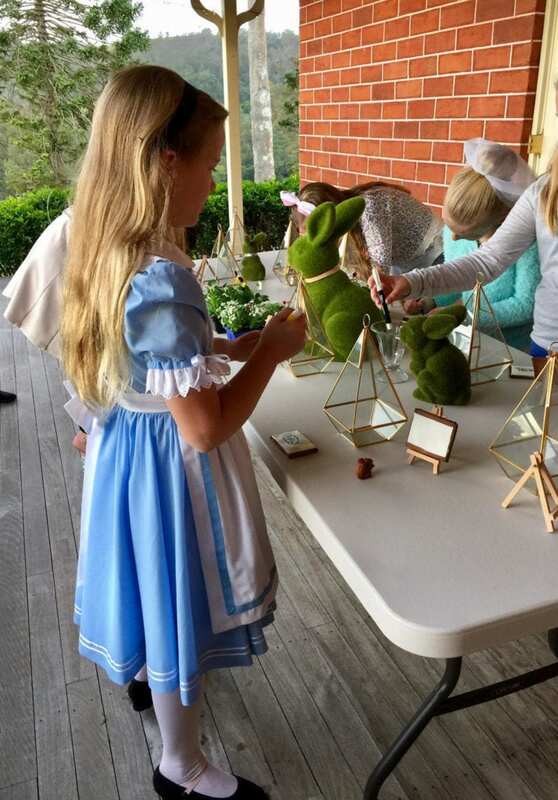 There are so many amazing ideas on Pinterest for an Alice party that you really could fall quite a long way down the rabbit hole…….. so with a lot of restraint, I got planning. Croquet– Obviously you need to play croquet! We have a large, level-ish lawn at the farm so there was lots of space for a game. There are many different types of croquet sets easily available to fit any budget. As we love family games that grandma can join in too, I chose one that will last and I’m really glad I did. This croquet set will live forever! It’s beautifully made, comes with six mallets and matching balls from Planet Finksa. Who knew there were so many different rules for croquet?! Should we play with English or American rules? Both lawn layouts are illustrated in the instruction booklet that came with the set. We decided as the Queen of Hearts was playing that we would go with the English rules. They had a practice round first and then played a real game. This lasted a surprisingly long time and they all enjoyed the game. Paint the roses red– The invitation stated to “dress for a tea party” so I didn’t really want the girls using red paint in their party dresses so they painted cookies instead. I made rectangular chocolate biscuits, smeared on a bit of buttercream icing and popped a rectangle of white fondant on top. The fondant needs to be left overnight to dry out and then they can be decorated with edible marker pens. You can find edible marker pens in the cake decorating section at Spotlight. 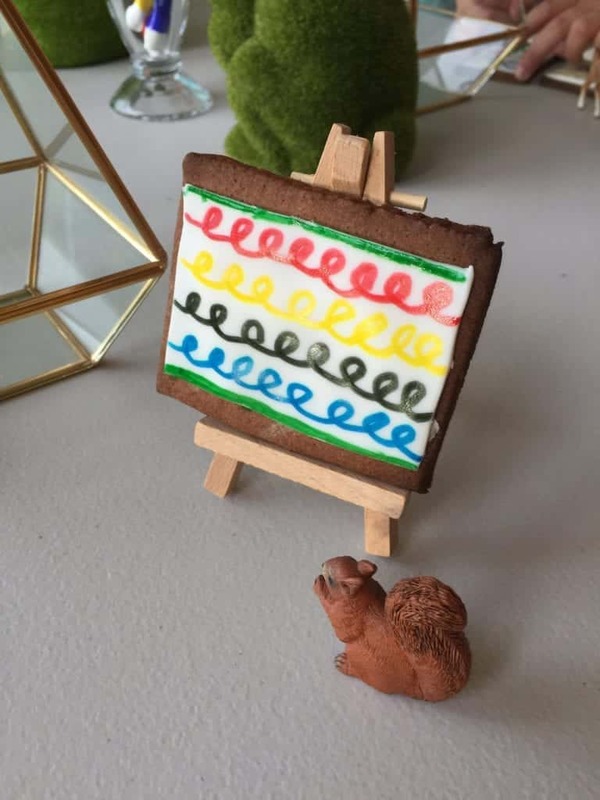 I displayed the biscuits on tiny easels. Everyone made two. One to eat now and one to take home. 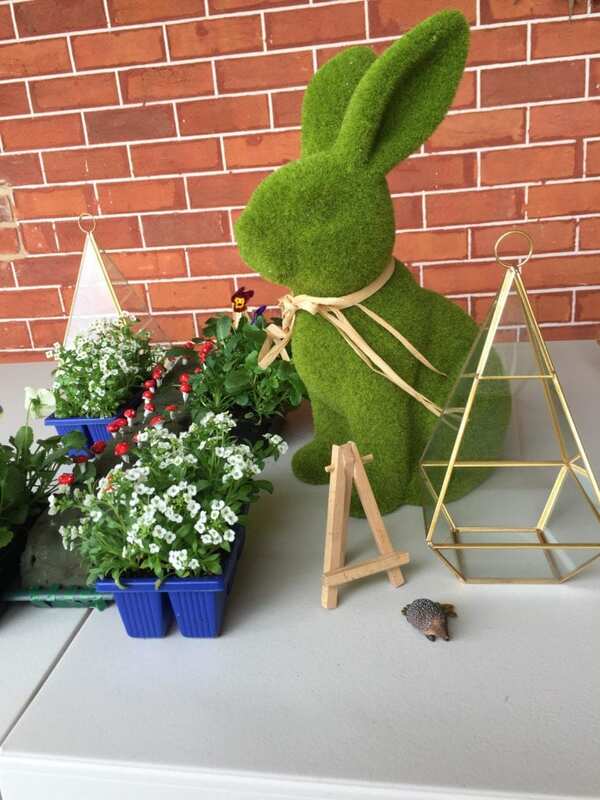 Make your own terrarium– Well, you need tiny gardens at a garden party! My lovely friend Meredith (who also made the birthday girl’s dress!) led me to this terrarium tutorial by The Paper Mama. 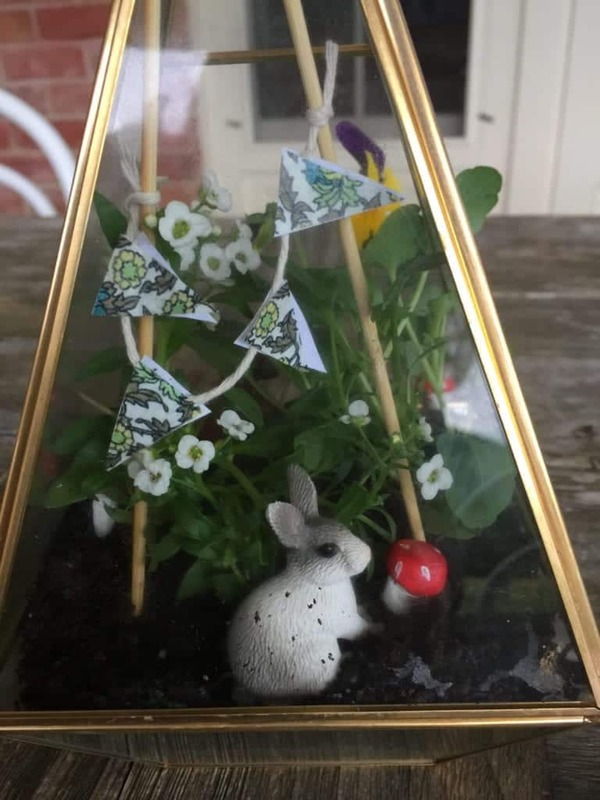 The tutorial has a gorgeous woodland terrarium printable that includes mini bunting, a deer and tiny mushrooms that you can cut out, glue on toothpicks and add to your terrarium. The girls spend AGES (yay!) cutting out their bunting and gluing it on to strings. I found the terrariums at Kmart for $8. The girls scooped some gravel into the bottom, then potting mix and planted some potted colour in their terrariums. The birthday girl and I used some air dry clay to make tiny mushrooms on sewing pins a week before the party. We painted the tops red, added the white spots and the party guests planted them in their terrariums. 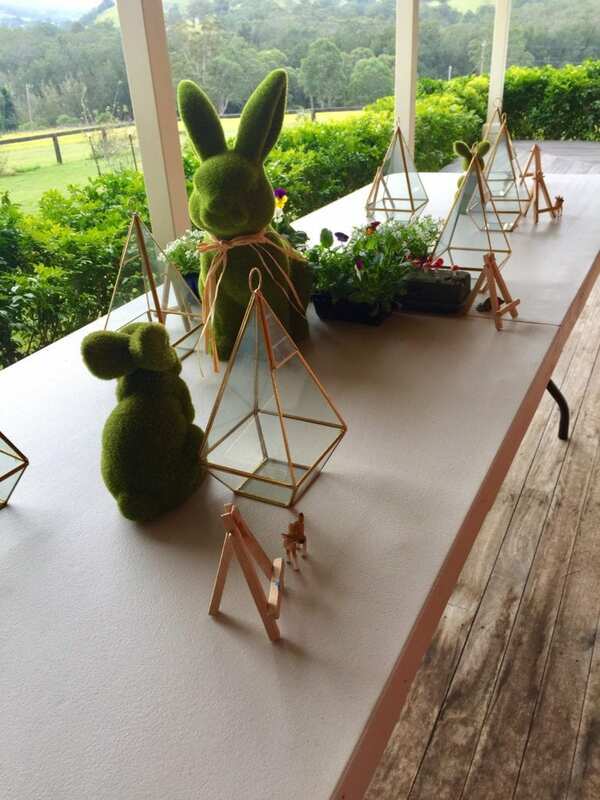 Each guest also selected a little woodland animal figurine to add to their garden. Ok…. This is where Pinterest can get a bit out of control! 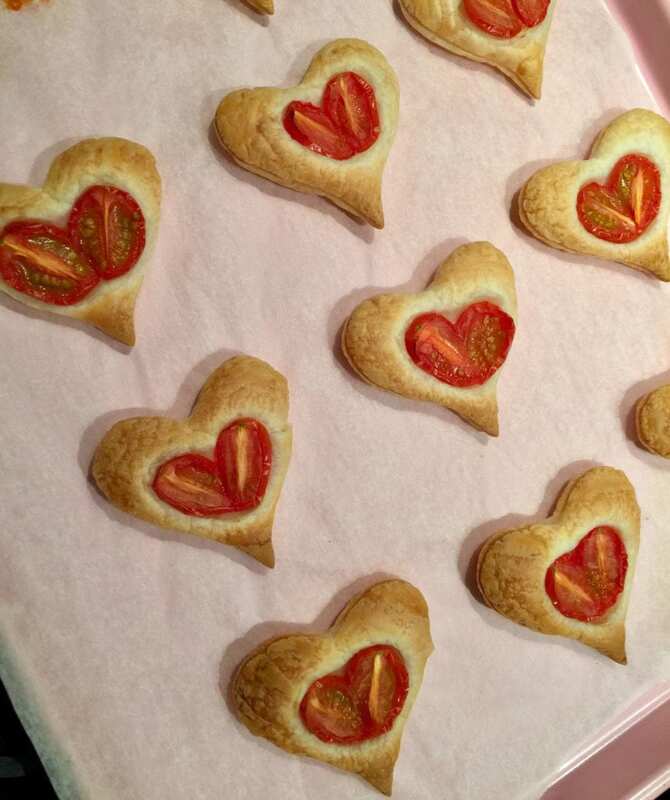 Mushrooms made of a strawberry and a marshmallow and a few dots of icing sound pretty easy….. right???? Well….. let’s just say that some things should just stay on Pinterest and not venture into your real life! OK?! I replaced the offending strawberries with raspberries and popped a white mini marshmallow in the hole. Voila! Instant mushroom. The tea party part of the party was just lovely. I had been lucky enough to inherit some non-matching tea cup, saucer and plate sets from my grandmother and I borrowed a few from my Aunty. The rest I purchased from Vinnies for between $8 and $10 for a set. The girls LOVED using real china and were perfect little ladies. Even the brother’s used the tea cups! 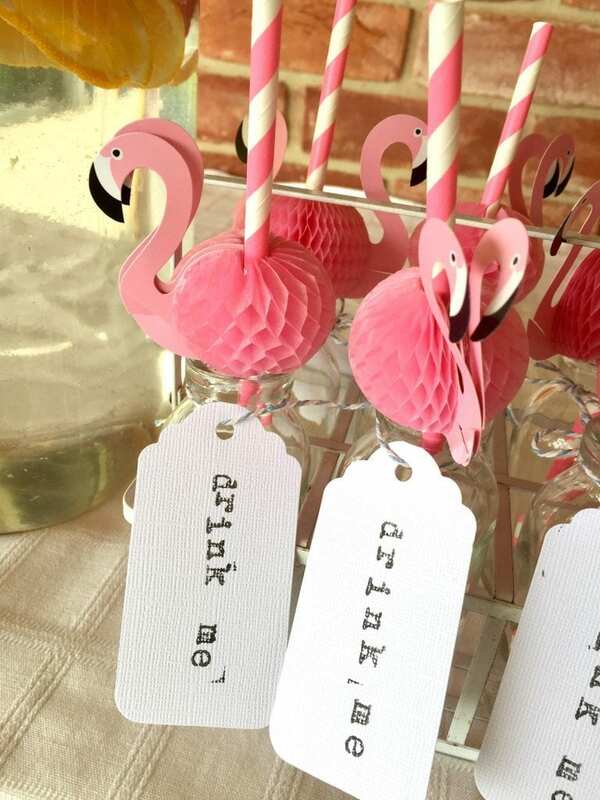 We had water with sliced orange and strawberries in a dispenser and tiny “drink me” bottles with a flamingo straw from Sunny Life. The tea pots were filled with hot chocolate which is very satisfyingly tea coloured! Grape caterpillars – they really loved these! And of course, birthday cake. They pretty much ate the lot! The little lady thoroughly enjoyed her party and her friends tell me whenever a new flower appears in their terrarium so I would have to say that it was a very successful party! 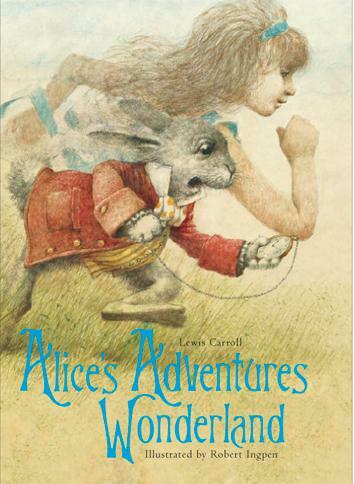 My favourite editions of Alice in Wonderland can be found here. 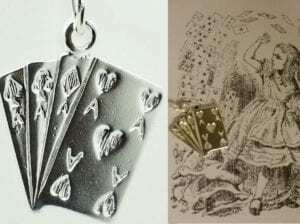 One of my nieces had an Alice in Wonderland party a few years ago and I purchased her some of the above Alice in Wonderland charms for her bracelet (and one I did as a necklace) from Oh My Giddy Aunt here. 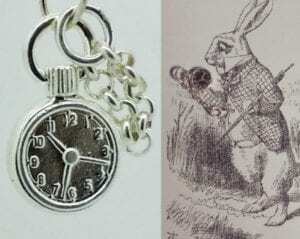 Don’t forget that all Children’s Books Daily readers can receive a free charm from Oh My Giddy Aunt (see below). For more Book Parties click on the links below. Oh My Giddy Aunt offers all Children’s Books Daily readers a free sterling silver ‘lucky dip’ charm with the code ‘childrensbooksdaily’.